With the weather 80 degrees during the daytime and 70 degrees at night, it is nearly perfect here in the Florida Keys. Typical days tend to go like this. Up around 7-8, breakfast around 9. Boat work, web work and communications in the AM. 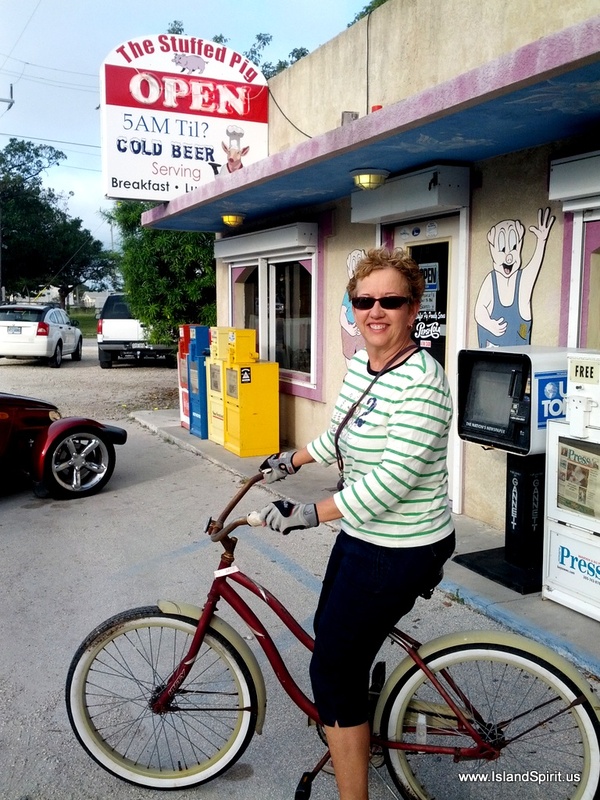 Bike riding after lunch to the Post Office, grocery store, scenic Seven Mile Bridge, over to visit friends at other marinas, or a ride out to the beach. By 5 pm, it is “The Cone of Knowledge” or TIKI HUT time to watch the sunset and share stories and libations with good friends. At sunset, it is conch blowing time to alert the natives to the end of the day. Dinner is around 7 pm which is usually cooked onboard but sometimes we take in one of the many fine eateries around Marathon. The day will end around 10 pm as we count our many blessings for good friends, good health, and this simple peaceful lifestyle. Docked at Harbour Cay Club, we can become spoiled because it is so easy to live here. We always enjoy our time in the Keys! Here are some photos of the past week…. Ocean Sailors Nancy and John arrive after sailing a prolonged gale of 35 knots. 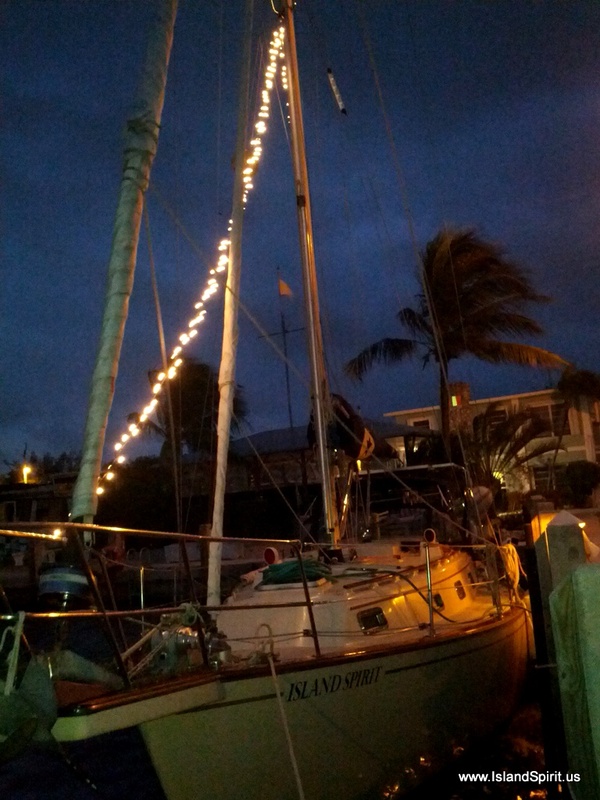 They sailed 3 days straight from St. Augustine to get here for Christmas! Egret waiting for hand outs during a fish cleaning. with blue skies, Merry Christmas! Marjorie and Radeen laughing and working very hard in the kitchen. As many people have said before, the cruising life is great. BUT, it is the people you meet that make it so interesting and so enjoyable. Merry Christmas and Happy New Year to all……. Destination #1 for this year’s winter voyage has been reached! 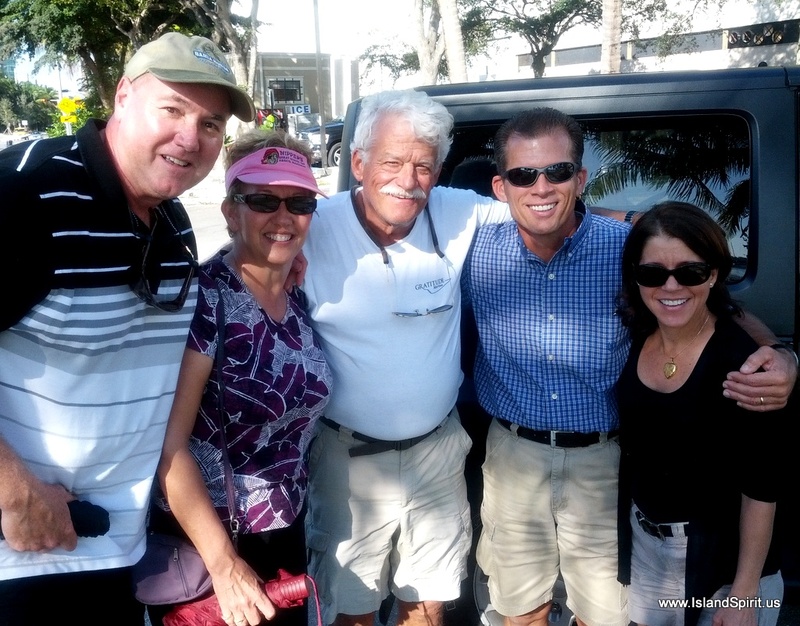 On Dec 11th, we arrived at Harbour Cay Club, a private marina where our good friend and fellow Island Packet Owner, Capt. Jim owns one of the 24 slips. The unused slips are rented on a weekly or monthly basis to others when available. This club is lovely, with beautifully maintained landscaping, a sunset Tiki Hut, comfortable club house with a second floor condo for rent, laundry room, bath house and free ice machines! This place will SPOIL you for any other marina, making it difficult to move on from here. We have one month booked and our plan is to sail back up to Miami on Jan. 15, where we will que up for our Exuma Bahamas run. For now, we will enjoy a peaceful Christmas and New Year’s. The owners make us feel so welcome here at HCC! While here, we always make a list of boat jobs and spend much of our time working on the boat, riding bike, enjoying the Tiki Hut Sunsets and Libations at 1700 hrs, and just relaxing. When moving the boat everyday for 40+ days and 1,300 nautical miles, it is really nice to simply STOP. That is exactly what we planned and it is exactly what we are doing. We enjoyed a small Island Packet group luncheon in the Lanai with Mike and Carol, IP31 NOMAD, Keith and Blanca IP31 TRUE LOVE, Capt Jim and Michele IP29 FORTUNA and Radeen and Hayden IP35 ISLAND SPIRIT. What a great afternoon with representation from services such as… Marines, Army, and the Miami Police. Our IP fleet is so interesting! Here are some photos of the current activities. and side drops to block the western sun. The IP Battle Flag is raised. We are really enjoying ourselves here and we wish everyone a peaceful and calm Christmas season. Hawk Channel 2012. This is our second time sailing SOUTH in the Hawk, and, once again, it did NOT disappoint us. Flat water 1-2, winds 10-15 and 50 miles of close reaching. Who can ask for more in the sailing world? Not us. We LOVE Hawk Channel. Yesterday, we departed Dinner Key at 1500 hrs and ran down Biscayne Bay to Elliott Cay where we dropped anchor in the dusk. Easy run. In the AM, we were underway by 0700 hrs and transiting Angelfish Creek by 0800 at high tide, perfect. Exiting the creek we found 6 feet 6 inches of water as we passed over the reef. Our boat needs 4 feet 6 inches, so not a problem. We left the Helicopters on Yachts Behind…..really! Mommy called….bring the yacht home…so home they go! The north end of Biscayne Bay could become our winter sailing grounds as it has so many great places to sail to and to explore. We also have great friends here within the IPY fleet, Keith and Blanca who sail IP31 True Love. When we sail through here, Keith and Blanca have gone out of there way to help us and spend time visiting and sharing stories. I know I have said this before, but the IP Fleet is so connected, so supportive and such a family, that we all look out for each other and we always help each other in any way we can. Keith and Blanca are perfect examples of our fleet motto. 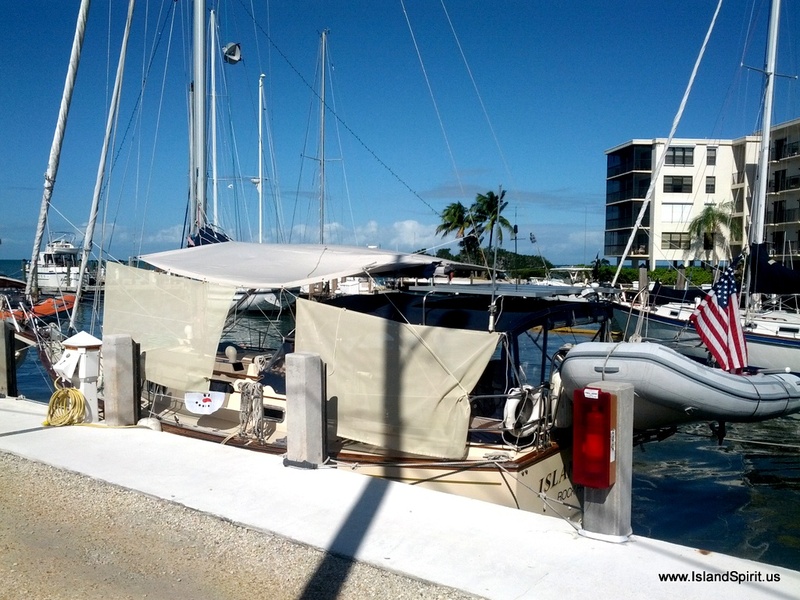 This factor makes owning and sailing an Island Packet Yacht such a great joy. Team Island Spirit and our buddy boater Henry on IP35 Sans Souci Too, joined us for a great lunch at Flanigan’s in Coconut Grove. What a fun town! Anchorages and places to visit in north Biscayne Bay are many. Here is a map with an X at places we have explored. 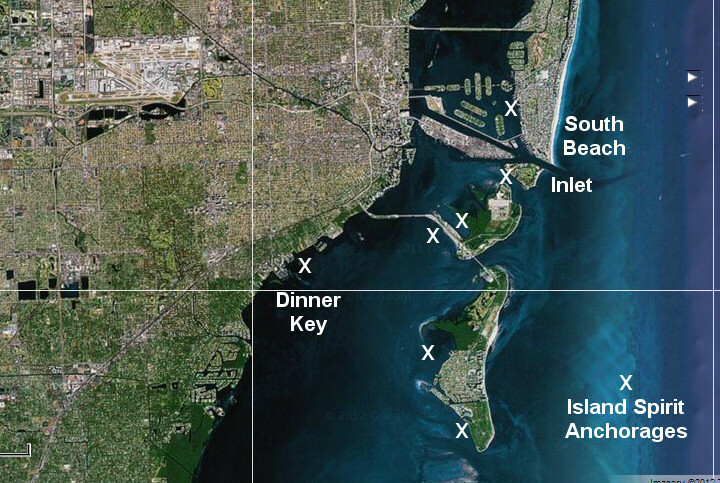 Dinner Key to the west is ground zero and where the moorings and docks are located. To the north is Miami Beach and the famous South Beach area, very fun to explore. Then to the east are Virginia Key and Key Biscayne where No Name harbor is located. Open Google Maps and simply look at satellite images of this water. This is a PARADISE sailing are. Heading into shore in the AM as we were going for a few groceries, we were entertained by this cormorant on a mooring ball drying its wings in the hot Miami sun. 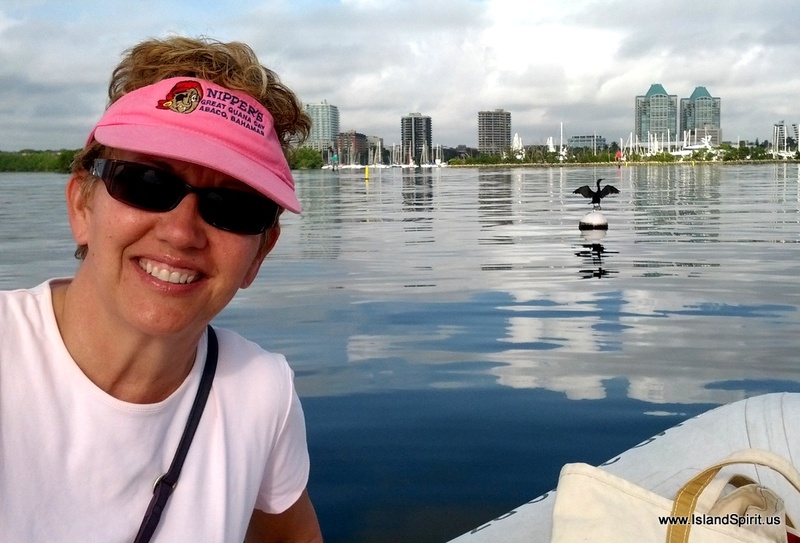 We motored right up next to this bird and it was really fun to observe him so closely. These birds dive under water and swim with their wings to catch fish. They are amazing to watch. Then they have to dry off their feathers for better flying. We see this all the time but it is still fun to observe. So, you want to have a powerboat in Miami? Well, this is how you store it and this is how you get it launched and re-stored. 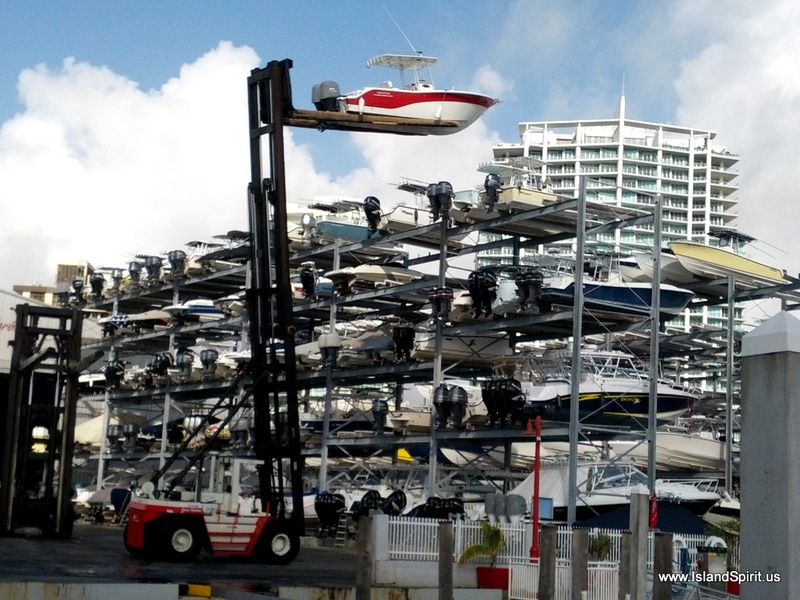 They use a massive forklift and your boat may be on the fourth level 35+ feet in the air. They are NOT tied down, and I have no clue how they don’t blow off in the storms. But this is how they do it. 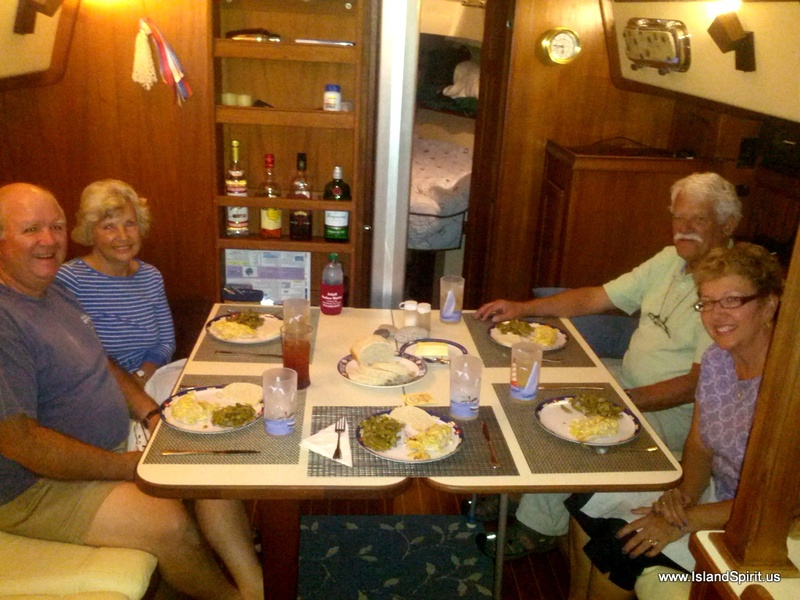 It is getting close to CHRISTMAS and here is proof….our other buddies, Walter and Donna on IP350 Windspell stored here in Dinner Key for a week as they traveled home to family and friends. 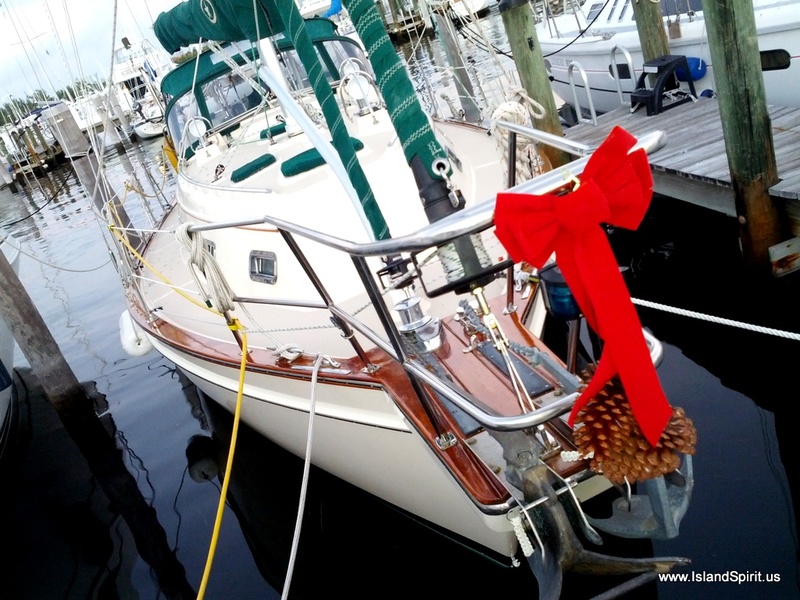 We found their boat to check up on it and noticed the beautiful “bow on the bow.” How festive and beautiful! Tonight we are anchored off Elliott Key in Biscayne National Park, about 20 miles south of Miami. At dawn we will pass through Angelfish Creek into Hawk Channel and sail and or motor the 45 miles down to Channel Five where we will cross back to the north side of the Keys. From there it will be an easy run the next day to Marathon and HCC, Harbour Cay Club, our Christmas and New Year’s destination. Miami Beach / South Beach Florida is one incredible place to visit by sailboat. First of all, sailors can anchor right off the west shore of Miami Beach and then take their tenders into the Collins Canal and tie up to a small dock right on Dade Boulevard. It is easy to climb out of the canal and walk into town or hop on a local bus for 25 cents and ride it to Ocean Drive. We chose to walk via Lincoln Road Mall and then meandered our way east to Ocean Drive where we turned south and then walked down to 8th Avenue. The scene is really fantastic with restored Art Deco Architecture and beautiful street side cafes and sidewalk dining. We simply kept walking south and south and south and eventually needed a break and took time for a nice late lunch. We had a sidewalk table at THE NEWS CAFE, 8th and Ocean Drive, and enjoyed a Cafe con Leche and a Cuban Sandwich while watching the people walk by. Life is absolutely surreal on Ocean Drive, South Beach, Miami. The weather is beautiful, the people are lively, the architecture is fabulous, the beach is spectacular, and the pubs and restaurants are top notch. It would be very interesting to live here! Speaking of living here, we found a one bedroom/one bath efficiency apartment for sale for $105,000 that is rented for $2,000 per month. WOW, what an investment. Living in Miami Beach Florida is a life in contrast. Some people drive a Rolls Royce, others drive a VW, some live in million dollar condos while others live in the city parks. One block is for millionaires while another block is for the homeless. We have never been in a city with so much diversity within such a confined small area. From a boating perspective, it is easy to anchor off the west shore, and it is a wonderful town to walk and to visit. There is no place in the world like Miami Beach / South Beach, Florida! It is ….FUN…DIVERSE…and …INTERESTING…. the fastest car in the world. 265 MPH in one mile, 0-60 in 3.7 seconds! Hey, I can do this. I know how to use a camera. Hey….I have that camera! 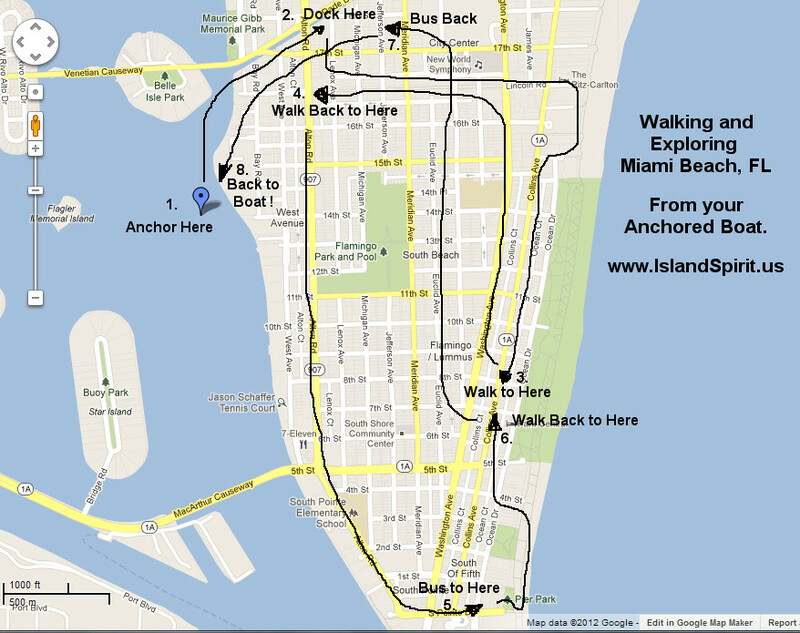 Here is a MAP of WHERE WE WALKED as we explored Miami Beach! Click this map and study! What a day, what fun. Imagine, all day to walk around Miami Beach and South Beach, Florida. We are living a dream, and we appreciate every day. Thank you for sharing our adventures together. Tomorrow, we will move south to Dinner Key and Coconut Grove area for a few days. Departing Fort Lauderdale, we motored between two mega yachts, Seven Seas on starboard and Pegasus Five on port. We then passed under the 54. 8 ft. 17th Street Bascule Bridge without asking for an opening. Our mast is only 48 feet plus our aerial of 1.5 feet, so we have a total height of 49.6 ft. We had room to spare but it looked very close. (Note: If you ask for a bridge to open and you did not require the opening, Florida can fine you $25,000!) Next was the Port Everglades cruise ship terminal with one ship docked. The ICW from Ft. Lauderdale to Miami is only 26 miles long, with 8 lift bridges, and then the infamously short Julia Tuttle Bridge at only 55 feet. That is a BIG error as all other ICW bridges are 65 feet, but this one is 55 feet. Oops! So, tall sailboats need to exit to the ocean at Fort Lauderdale and sail outside to the Miami inlet known as Government Cut. Boats shorter than 55 feet, like ours at 49.5 feet, can stay in the ICW and pass under this low, non-opening bridge. Here is photo progression of our day from Ft. Lauderdale to South Beach. Now that is a massive ship! There it is….the JULIA TUTTLE bridge, built to 55 feet, NOT 65 feet…OOPS! Thank you for building a new dinghy dock in the Collins Canal! Yes, that is a McLaren….a $500,000 dollar car, only about 100 in the USA! Brand new yacht being cleaned for delivery. Notice the people! This is about 90 feet long. open that and then ZOOM around and look at the islands and waterways! The photos for today are of the motor yacht Seven Seas (7C’s), rumored to be Steven Spielberg’s yacht, and Pegasus V which is available for charter. Finally, we show an 86 foot Domino by Riva Yachts, which in this town with these other big players, looks like a dinghy! It is unreal that an 86 footer, which sells for six million dollars, looks so small. This town is for very high rollers and it is really interesting to see their yachts up close. Here is a photo essay. Note the crew getting ready to rappel off Seven Seas to clean the sides! Notice the hotel and the balconies blocked by this enormous yacht! 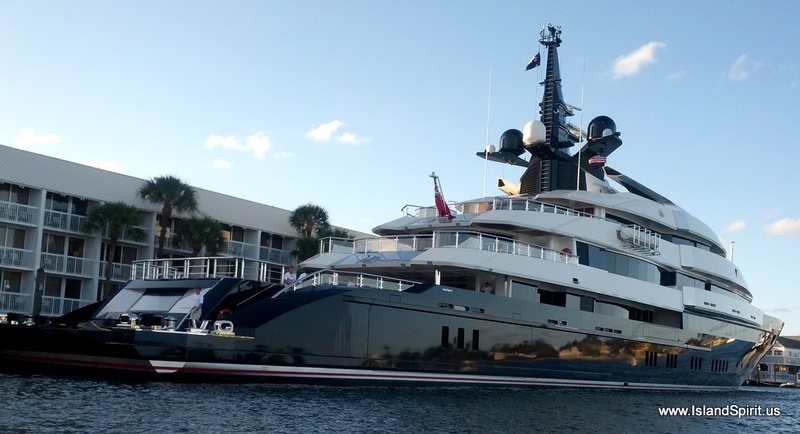 In Fort Lauderdale, it looks small compared to other yachts! 65 Foot Motor Yacht at a home looks so ordinary! 65 FOOTER!!! Question: WHY ARE THE MEGA YACHTS HERE in Fort Lauderdale, FL? Yachts enter the inlet, turn north under the 17th Street Bridge and dock. There are also service yards south of the inlet as well. Delray Beach to Fort Lauderdale, Florida on the ICW presents a photographic delight, especially in the early am light. Lucky for us, we started off the day with an email from a fellow Island Packet 31 owner who sent us a photo of our boat as seen from his high rise balcony. That was VERY COOL. We stepped outside and looked around and sorta figured out the angle. 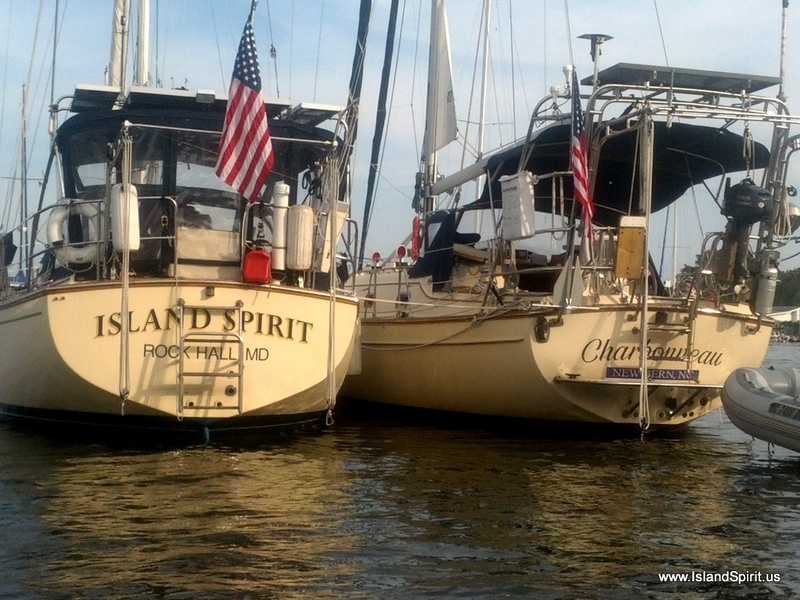 We exchanged emails and shared our departure time and Glenn was able to take this fantastic photo of Island Spirit as we headed south on the waterway. THANK YOU GLENN, the photos are a real treasure. Today was also another day of 10 lift bridges in about 22 miles as we planned to make Fort Lauderdale our next stop. The homes and the mega yachts along this section of the waterway are really incredible. The success of so many people and the extreme wealth of so many people, all in one place, is hard to fully grasp. Today with the Internet it is easy to Google a Yacht name and find out who the owner is and what their businesses are. Many famous people call this area home and it is very obvious. I shot 130 photos today, and many I have taken before. Please enjoy this photo essay of the waterway in are around Fort Lauderdale, Florida. All of these homes are SINGLE homes, not condos or complexes….SINGLE HOMES! One Home, but 3 home lots at least….on the water! Who knows the sq footage? 7,000, 10,000 sq.ft.? Motors are $21,000.00 each X 4 = $84,000 just in motors! There, that is better, keep the yacht low and off to the side so we can see the home! Fort Lauderdale, Florida…..what a place for the rich and famous. We will spend tomorrow here and explore some more. It is just too much fun and too interesting to move on. Next stop….South Beach, Miami! We have not even reached Fort Lauderdale and as always, the ICW waterway, between Hobe Sound and Delray Beach, is a warm up of what you will see farther down the way. Hobe Sound is near perfect with a narrow barrier island on the ocean beach, then one road running north and south, and the home lots reach the sound side where they dock their mega yachts or fishing boats. Here you have the best of both water worlds: Ocean Beach and Bay Sound Dock! OMG. Today was the day of bridges, with 15 lift bridges and we ended up waiting a total of 2 hrs and 20 minutes over the course of the 43 mile day for bridges to open on their schedules. It can be stressful waiting in front of a bridge with a 1+ knot current, but lucky for us, it was on our bow, so we could simply set in front of the bridge and keep powering into the current flowing at us. It is like setting in a river. After Hobe sound we transited, Jupiter, Juno, North Palm Beach, West Palm Beach, Palm Beach, Lake Worth, South Palm Beach and Delray Beach where we dropped anchor in Lake Pelican! This lake is surrounded by beautiful homes and is 10 feet deep with a 6 foot shoal at the entrance. Lucky for us we only need 4′ 6″ of water so we passed into the lake! No one here on anchor except us. Typical Run About Fishing Boat with 1,050 horsepower! Small Ocean fishing boat, about 75 feet long! WHAT? Yes, a HOUSE on a barge that was sinking! Just launched Motor Yacht ACE at 87 meters long! Sleeps 12 Guest with a crew of 30! Look, it is 5 stories tall above the water! In West Palm, these yachts are everywhere. Somehow, we had the fortitude and motivation to actually depart Vero Beach City Marina today. The nick name for Vero Beach is VELCRO Beach because cruisers get stuck here and never move on. We actually met a woman who has been here aboard her boat for 2 entire years! We only stayed 3 days and departed for MIAMI, where we want to anchor off South Beach. Time passed quickly with bus runs to Publix for groceries and walks to the beach and around town. Of course, there are the weekly Thursday night social gatherings in the club pavilion and we also organized one for a smaller group on Wed to visit many other owners. Vero Beach is a destination and we could easily live at Vero. We enjoy Miami, too, however, so we have moved on. Try this at a speed of 6 miles per hour ! FOR SALE….this could be yours ! Tomorrow….48 statute miles to Lake Boca Raton, with ten bascule bridges, then on to Ft. Lauderdale and THEN….MIAMI. Can’t wait to get there. Thank you for traveling along!